« Beware , there is one more dangerous face for atherosclerosis ! 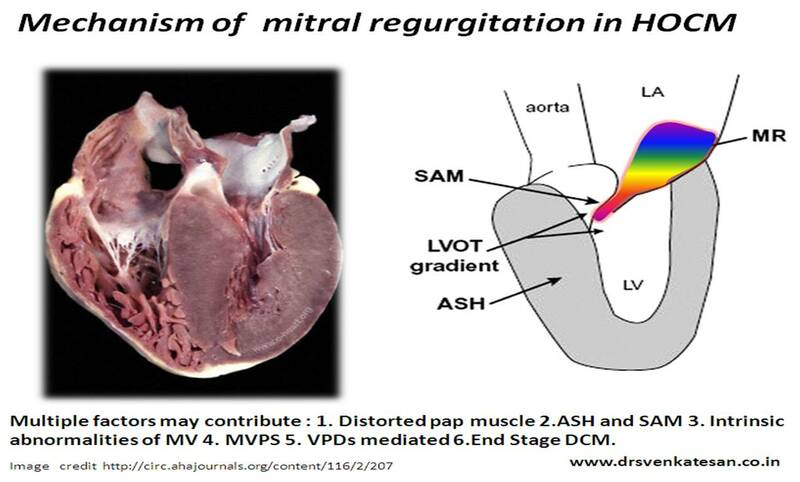 What are the mechanisms of mitral regurgitation in HOCM ? Hypertrophic cardiomyopathy(HOCM) is a relatively common inherited myocardial disease.Since it predominately involves LV myocardium and we know LV muscle mass is an integral part of mitral valve apparatus , it is natural HOCM has a major impact on mitral valve function . The mechanism of MR in HOCM is attributed to the following . Intrinsic abnormalities of mitral valve. * This mechanism is considered less important , as SAM is almost universal in HOCM but MR occurs in less than 20% patients with HOCM. In HOCM the MR is more often eccentric .This is understandable as the primary mechanism is related to faulty angle of pap ,muscle vs leaflet attachment. If SAM is primary mechanism jet is directed posterior. Is rarely pansytolic as the mechanism of MR begins to operate well after the systole starts . Many times it is difficult to differentiate LVOT murmur from MR murmur . Th ever confusing and tentative maneuvers might help in few shrewd cardiologists. Very often MR jets are mistaken for LVOT gradient.Ideally two gradients in isolation (or overlapping each other) one bell shaped other dagger shaped must be documented. Please note : LVOT jet is different from MR jet in size, shape, timing and site of maximum signal . Still it is often be confused with one other. Most common reason for this is technical .A careful apical 4 chamber view with well opened LVOT will reduce the error . Never record a HOCM echo without ECG gating . The MR jet may be very trivial in color flow but doppler will still pick the signal well . 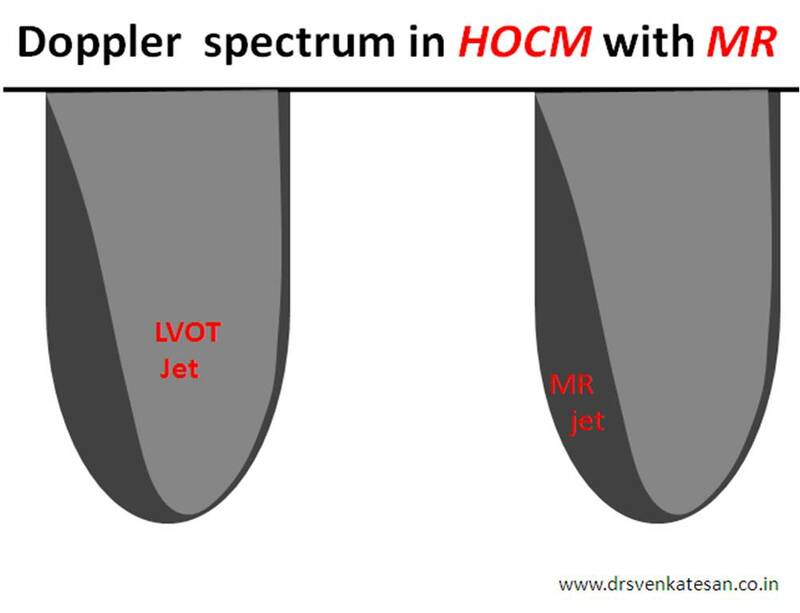 Realise ,for hemodyanmic reasons MR jet must be always more than LVOT jet.Finally if you get a report a LVOT gradient > 100mmhg in HOCM suspect it to be MR ! More often your suspicion will prove to be right ! Can mitral regurgitation occur in non obstructive HCM ? Yes , in few . This is due to intrinsic abnormalities of mitral valve . What happens to MR with surgical correction ? Can medical management regress the MR ? It is expected to regress.But many patients don’t. Effect of beta blockers on MR severity is not studied well. Most cases of MR do not require specific intervention.Just reassure them. Correction of LVOT obstruction is expected to relieve MR considerably. Mitral valve repair may be necessary in few with re-engineering of pap and chordae . It needs to be realized whatever we do for the HOCM patients , the ultimate outcome is determined by the quantum myocardial disarray the patient has inherited from their parents.The myectomy , the alcohol ablation, mitral valve repair, DDD pacing , beta blockers all are palliative. Except a few , most HOCM patients generally live their natural history .